Rholaisa B. Mamailao is the Monitoring, Evaluation, and Learning Specialist of Impl Project assigned in Lanao area. She facilitates focus group discussions, community validations, writeshops, and other research and community work related activities. She sees working with the Impl. Project team as an opportunity to continuously assist neglected communities in the Lanao area, especially victims of the recent Marawi siege, and resolve the systemic causes of problems in Lanao area. Previously, Rholaisa worked as a Program Assistant with the Volunteerism Community Engagement Program (VOCEP) and as a Research Assistant for projects funded by the National Research Council of the Philippines (NRCP) in collaboration with Mindanao State University – Iligan Institute of Technology. She has continuously involved herself in data gathering through various projects, namely the Poll Survey, DILG-CSIS, NRCP Lake Lanao Survey, ICES-Dev Survey, PhiliDar Survey, and others. Recently, she was involved in psychosocial interventions for the Marawi IDP children and relief operations to the community based center. 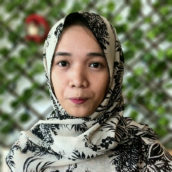 Rholaisa is currently studying for her Master Degree in Sociology at Mindanao State University – Iligan Institute of Technology (MSU-IIT).